Description: The NS H14 lugging ballast westbound on the NJ Transit Bergen County Line. Description: Norfolk Southern Mega Yard/Local job BT11, with GP40-2, 3035, has just returned from the Ann Arbor railroad, with interchange cars, as it backs into Mega Yard to set off its cars, at the end of the day. Description: Norfolk Southern job BT11, with GP40-2, 3035, having just returned from the Ann Arbor railroad, with interchange cars, is backing into Mega Yard to set off the remainder of its cars, as another job with NS 9267 comes out to pick up cars BT11 left on the inbound. 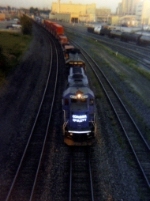 Description: Eastbound L46 crossing the diamond at CP 79. Description: Down at the engine terminal. Description: L42 pulls M of W gondolas toward CP 79. Description: NS 3035 in Augusta MI picling up to grain hopper cars. 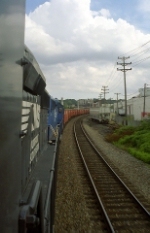 Description: Passing through NSs Jackson yard on the train. Title: NS 3035 is a nice looking GP. Description: I can't remember the last 4 axle I saw on the NS, before this one. Description: NS 3035 and NS 7138 sit at the fuel racks at East Wayne yard in New Haven.